Tickets are now available to book for our 2019 flagship family business conference. 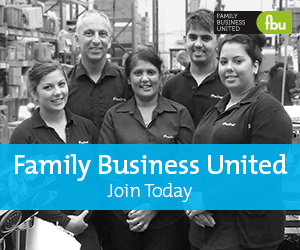 Join us in London for a truly inspirational family business day! Join us in London for our flagship national family business conference that is now in its seventh year and not only does it bring the family business together, it provides a great opportunity to discuss some of the unique challenges facing family firms and to hear insights from other family business people and their advisers who have already dealt with some of these challenges too. As well as some great speakers providing great insights there are a selection of workshops, a mini expo during the networking breaks where you can sample some great British family business products and there is plenty of time for networking too. Great speakers. Great insights. Great value. We look forward to welcoming you to London in March 2019. John Stevenson is the MP for Carlisle having been elected in 2010 and with a family business background and lawyer is also the Chair at Westminster of the All Party Parliamentary Group for Family Business. Leo Johnson leads PwC's Disruption practice and Co-Presents the Radio 4 series 'Future Proofing' exploring the impacts of exponential technologies on Business and Society. Formerly at the World Bank, Leo is the co-Founder of the advisory firm Sustainable Finance, now part of the PwC group. He is the co-author of 'Turnaround Challenge: Business and the City of the Future' (Oxford University Press, 2013) and a Visiting Business Fellow at the Smith School of Enterprise & Environment at Oxford University. Carina Contini is a critically acclaimed Scottish chef who opened her first restaurant in Edinburgh back in 1996, and is part of their independent family business that has been in operation since 1919. 2019 marks a number of milestones for the family and the business and Carina is going to share her thoughts on the importance of family firms, what makes family firms special and a personal insight on their journey as a Scottish family business too. Bambino Mio are the most widely used reusable cloth nappy brand in the UK with an award-winning range of products that are loved by parents all over the world. Founded on the principles of quality, convenience, style, comfort and value for money, as a business they are committed to developing products that are better for babies and the environment. Their aim is to deliver a superior customer service and product experience enabling parents to focus on the joys of parenthood with the intention of making reusable nappies commercially acceptable worldwide. Run by husband and wife Guy and Jo Schanschieff, Bambino Mio is based in the heart of the English countryside in Northamptonshire and has become a global brand in their sector as a result of focused social media and digital marketing strategies. Guy will share his insights into how, as a family firm, digital platforms can be a great way to build a business. Sian Steele leads the PwC Family Business team in the UK and will be chairing a panel that looks at the broader impact that family firms have on society through their philanthropic endeavours. Family business panellists will be announced in due course who will share their insights, personal perspectives and the far reaching benefits that are derived from these activities too. Workshops - Each delegate can attend one of the following workshops that run concurrently and will involve family members in the discussions on topics that are of importance to family firms across the UK. Simon Hannah is the fifth generation of his family to run the business, JW Filshill, a business that began as a confectionery manufacturer for 55 years before opening their first cash and carry operation. This quickly developed into a delivered goods business in the 1960’s. As was the case with many manufacturing industries, costs became prohibitive and the business evolved with a core focus on the cash and carry and delivered wholesale businesses. Filshill now employ over 200 people and are proud to have remained a family business and seen rapid expansion in the last twenty years. With a turnover in excess of £149 million they now have over 1600 retail Cash and Carry and Delivered Goods customers plus a number of wholesalers and several national accounts including the Scottish Prison Service. Simon will share his thoughts on how the business continues to evolve, how they have stood the test of time and what the future holds for their sector, as well as the way that the family values have been incorporated into the underlying essence of their family firm.